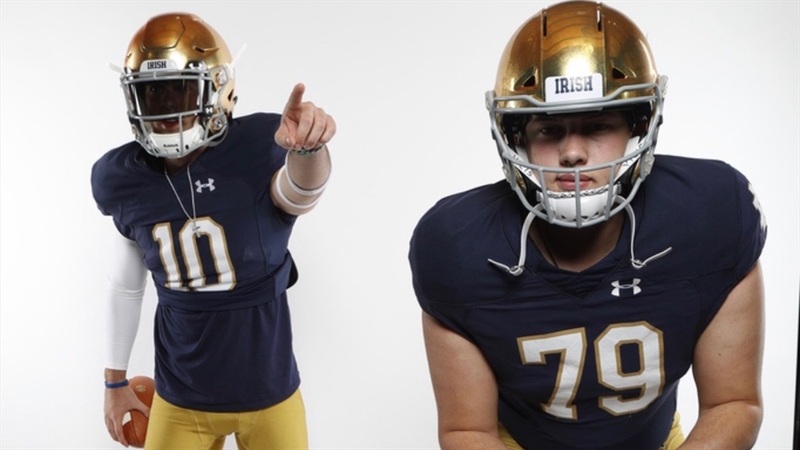 At this point, Drew Pyne‍ is as much a recruiter as a recruit, if not more, which is why the 2020 Notre Dame quarterback commit’s visit to South Bend this past weekend was as much about him spending time with the other prospects on campus as getting himself familiar with his future coaches and surroundings. The New Canaan High School star certainly participated in the typical things that come with unofficial visits. The Irish staff liked what they saw out of Pyne. Pyne spent a good chunk of his time hanging around with 2020 Arizona offensive lineman Tosh Baker‍ (pictured above with Pyne). He also spent time with New York running back Cullen Coleman‍, Ohio running back DeaMonte Trayanum‍ and California cornerback Clark Phillips‍. As much as Pyne loves to recruit for the Irish, he isn’t going to try to convince somebody who doesn’t want to be there or belong there. That being said, he plans on staying in touch with the prospects he was around this past weekend.